Rrrawr!!! Godzilla Attacks Bento! Citizens flee in terror! Actually, this bento was really cute and fun to eat as well. I wasn't scared one bit... ok, maybe a little scared. 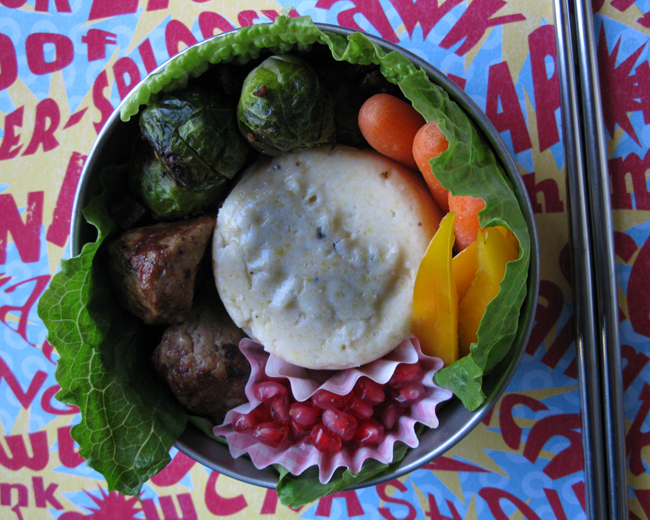 In this bento: teriyaki chicken meatballs from Aidell's, roasted brussel sprouts with Black Pig Meat Co Bacon, baby carrots, yellow bell peppers, white pomegranate arils from De'Santis Farms, and polenta in the shape of Godzilla. I darkened the top of the polenta here in Photoshop so you can see the Godzilla shape a little better. I picked up the cutest little jello/custard mold at Daiso and I tried it out with a polenta recipe from Martha Stewart. It worked great! Click here to see Martha's very easy recipe for creamy baked polenta. It will firm up if you chill it in the fridge. Cool idea with the polenta ^_^. Love the Godzilla, my oldest son will go crazy. BTW, I just passed on the stylish blogger award, please come by and claim it ^_^ congrats!! So cool! I love your Godzilla! Your polenta reminds me that I never tried making Carribean fungee, hopefully if I do get around to making it, it will look this good! thanks for the 2nd pic, I was wondering why this bento was godzilla. The mold is so cute! I wonder if it would show if you make rice krispy treats using the mold. hehe. white pomegranate arils huh? Interesting...how does it taste? So cute, and the title of this post deserves a special award for most original edible juxtapostion, SB!! Would polenta be appetizing with food color added (to make the design stand out)? I was in Sur la Table at Montgomery Village last week, and I was tempted to buy a set of all natural food coloring by a company called India Tree. Thanks Sysyl! Rrrrawr, hee hee. Thanks tatabonita! Yeah, I demolished the poor guy. I couldn't help it! He was tasty. Thanks karaimame! That Godzilla toy sounds fantastic! Thanks Lina! I just looked at your blog, I love it! Yep, I am sure the Godzilla would be a hit with your boys. Thanks Heather! I've never tried fungee either, sounds cool! Thanks Shannon! Yep, I need to play with this mold a bit and figure out how to make it stand out better. So creative to use jello/custard mold to mold the polenta! I have the same jello/custard mold from Daiso, now I know what to use it for besides making puddings & jelly! Thanks for the idea!